German Chancellor ANGELA MERKEL, whose leadership has been in deep trouble since the inconclusive election in September 2017, is continuing to cling onto her job as the fragile coalition she formed staggers from crisis to crisis. 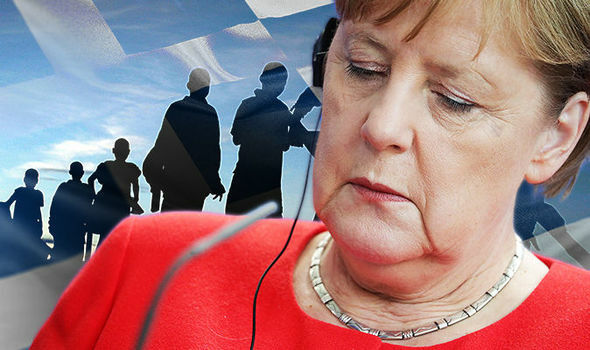 In the latest, a last minute deal with Greece that will see Germany send back migrants to Greece if they have already applied for asylum there allowed Merkel to escape a no confidence vote that could have forced her to resign. The beleagured Chancellor told a news conference today: “It’s good that we have got a result,” but Merkel’s Interior Ministry spokeswoman Eleonore Peterman added that she would not be able to reveal any details before the deal was formally signed. Last week, the Ms Merkel struck a similar agreement on returning migrants to Spain, confirming a deal reached in June when her increasingly divided Government accepted it would take back asylum seekers whose “first entry into the European Union was Spain”. The Greek deal would affect migrants entering via Germany’s border with Austria, enabling it to send the migrants back to the Mediterranean country within 48 hours. The German government is also in “very advanced” negotiations on a similar deal with the Italian Government, and fully expects an agreement to be struck in the near future according to Peterman. Last week, the Interior Ministry spokeswoman said last week that both Italy and Greece had made counter-demands on any deals agreed after announcing the breakthrough with Spain. A pact with Italy would provide the biggest breakthrough yet in Angela Merkel‘s struggle to get a stranglehold on a migrant crisis that once again threatens to tighten its grip on Europe again. The Italians are likely to be the fly in the ointment, having been at loggerheads with Brussels and several European allies including France, after refusing to take in thousands of migrants rescued at sea while demanding that others take them instead.